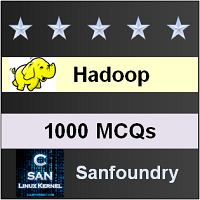 Our 1000+ Hadoop questions and answers focuses on all areas of Hadoop subject covering 100+ topics in Hadoop. These topics are chosen from a collection of most authoritative and best reference books on Hadoop. One should spend 1 hour daily for 2-3 months to learn and assimilate Hadoop comprehensively. This way of systematic learning will prepare anyone easily towards Hadoop interviews, online tests, examinations and certifications. Who should Practice these Hadoop Questions? The section contains questions and answers on hadoop ecosytems, history and big data coverage. The section contains questions on mapreduce basics, data analyzing and hadoop streaming and scaling. The section contains questions and answers on distributed file systems(HDFS), data flows and interfaces and archives of hadoop. The section contains questions on I/O and serialization, data integrity, compression and AVRO. The section contains questions on features and development of mapreduce. The section contains questions on mapreduce jobs, security, configuration, execution of tasks and YARN. The section contains questions and answers on hadoop clusters and mapreduce types and formats. The section contains questions and answers on HDFS administration, monitoring and maintenance. The section contains questions on pig basics, pig latin, user defined functions and data processing operators in pig as well as pig practices. The section contains questions and answers on hive basics and hive query language as well as the basics, schematic diagrams and metrics of hbase. The section contains questions on zookeeper basics and zookeeper services, sqoop basics and scoop with hadoop as well as cassandra basics and cassandra with hadoop. The section contains questions on hadoop incubators and hadoop development tools(HDT), chuckwa with hadoop, ambari with hadoop and knox with hadoop. The section contains questions on spark with hadoop, flume with hadoop, lucene with hadoop, hama with hadoop, hcatalog basics and hcatalog with hadoop, mahout with hadoop, drill with hadoop, crunch with hadoop and thrift with hadoop. The sections covers questions on miscellaneous other hadoop topics which include oozie, orchestration, utilities and libraries of hadoop on various platforms like microsoft, amazon, IBM and other topics in this section include bigtop, impala, storm, kafka and cloudera. If you would like to learn Hadoop thoroughly, you should attempt to work on the complete set of questions and answers mentioned above. It will immensely help anyone trying to crack an exam or an interview. Here’s the list of Best Reference Books in Hadoop. Wish you the best in your endeavor to learn and master Hadoop!